Earlier this year, Kathryn and I were invited to attend the (capsule) New York Women’s RTW & Accessories show. The event showcased the best high-end progressive designers and brands from around the world and we were able to get a sneak peek at their SS18 lookbooks and learn more about their specific style in the fashion world. The event was extraordinary! My favorite part was talking to the designers and learning more about their forward-thinking approach to design. And, yes, the fashion there was incredible! I was inspired to be around so many great minds. Feeling their excitement and their passion for their craft made this event so much more special for Kathryn and me. We met a ton of great people and companies. And even though we enjoyed many, there were a few that stuck in my mind the most. As we walked the event space, I wanted to capture those fashion trends and ideas so we could pass them over to you, our dedicated readers. In chatting with these companies, not only did we find great fashion, but we also got to learn about their brand story and how they are unique in their own special way. Here are six of my favorites. JCH creates bold, textural handmade jewelry accessories for the modern woman. JCH was the first booth that captured my attention at the show. When initially walking by I was immediately drawn to her unique jewelry pieces. Piece after piece I was falling more in love with her designs, textures, colors and uniqueness of each item. Here are a few of my favorites; Wide + Narrow rings, Ear Tassels, Tourmaline Studs, Woven Cuff, Crescent Necklace and DBL ARC + Fiber Necklace. I can tell each piece is made from the heart. 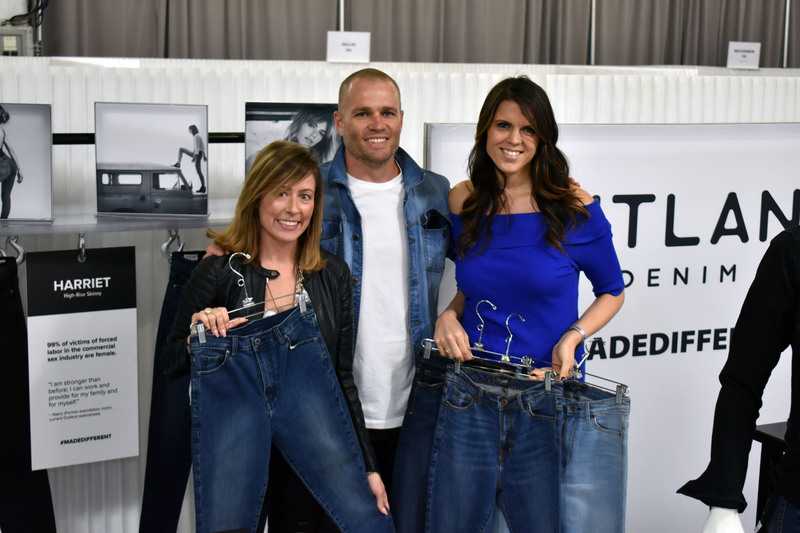 Outland Denim had quite possibly one of the best brand stories at the event. They created the Denim Program, which offers employment and training opportunities for women rescued from human trafficking, sexual exploitation and other human rights abuse. A higher quality of jeans is also a focus for this company based out of Australia. They don’t cut corners on their materials so these jeans will last a long time. You need to check this company out! We spoke with Aaron and James (founder) for quite some time. I was enamored by how passionate they are about their story and how they continue to make a huge impact for women. We reviewed the different styles of jeans and also the inspiration behind their names. As you know, until recently, I didn’t have much luck in the jean department and with the quality and length/style of their jeans – I have found another winner. Here are some of my favorites. Qilo is a contemporary streetwear brand for men based in NYC. I was drawn to their brand not only because of their sweatshirts (as you all know my love for sweatshirts) but their pineapple logo. Their clothing is made out of quality fabric and is very fashion forward. Here are a few of my favorites Cubix Graphic Sweatshirt, Suede Side-Zip Sweatershirt in pink and Two-toned Dad Hat in powder blue/orchid. Peony & Me is a contemporary athleisure brand that is taking the industry by storm. They have many interchangeable styles that are very fashion forward. Their products look fabulous in the gym and on the go. I loved every piece they had on the show floor and even their website. I actually own a couple of pieces from them as I recently learned about their company prior to attending this show. It was great to see them at the show and learn more about their brand and what sets them apart from the others. Voloshin is an effortless, comfortable, statement driven clothing brand based in Philadelphia. We met with Lindsay and Amy (founder) and we instantly had a connection. Amy’s love for fashion is deeply routed and her unique style and passion for ancient printing technique really sets her clothing line apart from the others. Voloshin uses only natural fabrics, as they don’t want their clothes to be made from fossil fuels. They love using block printing, which makes sense to have their clothing line produced in India where you will find some of the oldest blocking printing facilities (discover more on their process here). I loved their dresses – such amazing details on all of them. Many of their dresses can be worn for any occasion and they all were comfortable, stylish and very feminine. Check out more of their collection here. Katie Diamond is fine jewelry that is custom to perfection. Initially, Katie designed jewelry for her family and friends, which quickly turned into her starting her entire collection. I loved the display of her dainty and luxury looks showcasing her layering necklaces, elegant earrings and her assortment of stacking rings. Every piece has such attention to detail. Thank you to all of these brands for sharing their stories with the Empowering In Heels team. We loved being able to connect with this amazing community that is shaping the future of the fashion landscape. We look forward to watching your brand grow and being even more successful for years to come.